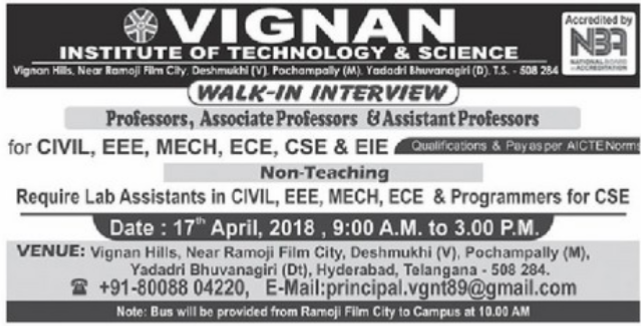 Vignan Institute of Technology and Science, Hyderabad has advertised in THE EENADU newspaper for recruitment of Professor/Associate/Assistant Professor jobs vacancies. Interested and eligible job aspirants are requested to walk-in 17th April 2018 9a.m to 3p.m. Check out further more details below. 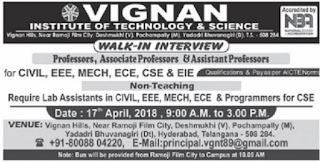 Vignan Institute of Technology and Science,is the brainchild of Dr. L Rathaiah, Chairman, Vignan Group of Institutions, was founded in 1999 with four branches of Engineering. VITS is an exemplary institution of higher learning with a mission of pursuing excellence in education and research. The institution, with their diverse and dynamic community of about 2500 students offers a distinctive combination of some of the finest facilities for MCA, MBA and M.Tech. with 5 different graduate, and undergraduate programs ECE, CSE, EEE, MECH, CIVIL, EIE accomplished faculty, world class facilities with hostel set on a sprawling 350 acres of sylvan surroundings of valleys and watersheds, mango groves and greenery. How to Apply: Interested candidates are requested to walk-in in the college campus from 9 a.m to 3p.m or resume can be mailed principal.vgnt89@gmail.com.